The Central Bank of Ireland is to issue a commemorative €2 coin into circulation this morning to mark the centenary of the 1916 Easter Rising and the Proclamation of the Irish Republic. The designer of the coin, Emmet Mullins, describes the design as, “featuring a depiction of the statue of Hibernia on top of the GPO where she has witnessed the events of 1916 and watched the growth of a nation since the Rising*." 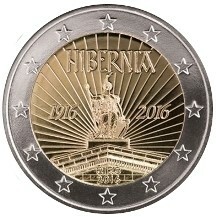 The coin includes the centenary dates, and the name Hibernia in hand-rendered lettering influenced by the book of Kells. This is the first time Ireland has issued a circulating euro coin to mark an event in Irish history. Some 4.5million of the coins will be released. Collector/Presentation coins are also available. *The original was destroyed in 1916.